Pallas is the astrological representative of the libertarian non-aggression principle. The planet of peace, the Spock within all of us, Pallas is the astrological force that keeps us all from running around killing and stealing at will like politicians or characters in a modern video game. 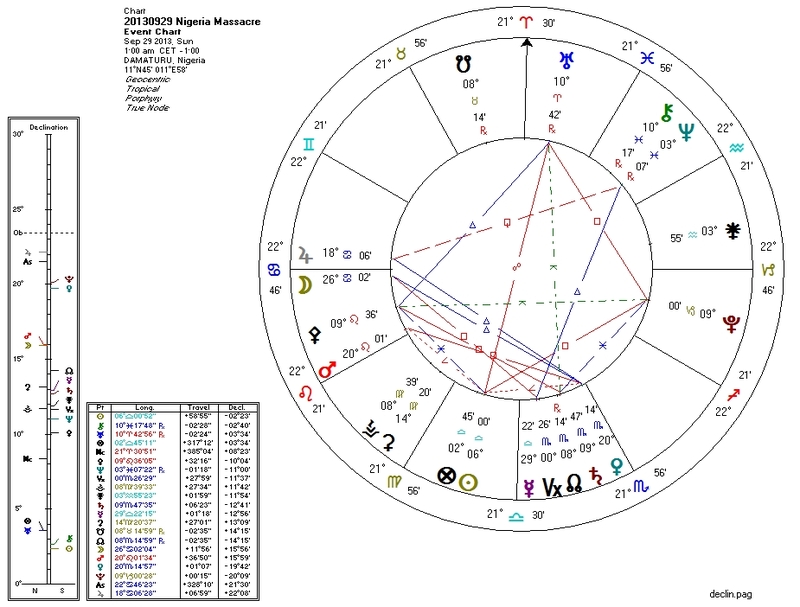 When Pallas and/or her sign ruler(s) are corrupted by Pluto, blocked by a discordant aspect with Jupiter, and/or weakened by the South Node: logic fails, governments reach for expanded powers, and blood runs in the streets. While most of news-reading America has been occupied by the Obamacare/budget soap opera, violent Islamists have been murdering students. 1. Pluto quincunx Pallas and square her ruler the Sun. 2. Neptune quincunx Sun (ruler of the 2nd) and quindecile Mars (co-ruler of Venus). 3. Venus in Scorpio, ruled by and tightly septile Pluto. 5. Pluto square the Sun. 6. Mercury at the IC. Optional, but an angular Mercury is common. The Pallas-Pluto quincunx is the tightest aspect here, and the primary trigger for this tragedy. It remains within orb for a few days. If the US Congress comes to any decisions within the next few days, they likely won't make libertarians happy.